For what will most likely be my final teaching experience with virtual worlds, I tried to add depth as requested by the last group, in Spring 2011. Notably, I added more clues, plus a real-life scavenger hunt / mystery on campus. Second, I added a combat system and some dangers to the House of Usher. I want to share the experiences and advice of the class this year, but I will do so in two posts. First, what students had to say went well. Each bullet point comes from a different student. As others with more support and energy than I have build virtual-worlds simulations, I hope this feedback will guide them. It was fun, but, frankly, too much work give how my job is structured. I doubt I would take on a project like this again, if I had to build it all from scratch. Be that as it may, thanks to my actor-volunteers and students. I felt that speaking on the screen, rather than with our mouths made the simulation more immersive. It made the simulation feel a little more game-like and controlled. Though we could say whatever we wanted, we had to be careful with our words, because it was up to the reader entirely to decide the tone of our words. Unlike the short story, the simulation did also provide me with an extra way to see into the characters’ minds: diary entries and notes. One particular example of this is a note written by Madeline, which states, “I do not think that Roderick is correct in providing me with Laudanum. I fear that it will not assist me with this malady of walking about at night. I would prefer to lock my door." In reading this, my player discovered a distrust of Roderick that Madeline does not make public. Playing as a character in a simulation allows for more direct access to the other characters themselves, though it remains impossible to fully delve inside of their minds. The amount of detail that went into the virtual house eased the immersion into the world of Poe. Because of the elaborate design of the virtual world, I was able to notice any important hint or clue that could help me with my task. For example, by reading the letters and journals that Madeline and Roderick wrote, I gained a lot of information about their respective illnesses and Madeline’s doctor. In addition to the copious amount of detail that the virtual setting offered, it also allowed me to create my own story. I was sucked into the recreation of the Fall of the House of Usher to the degree that it felt ‘abnormal’ being in the real world. There were many factors that allowed for such an amazing experience. 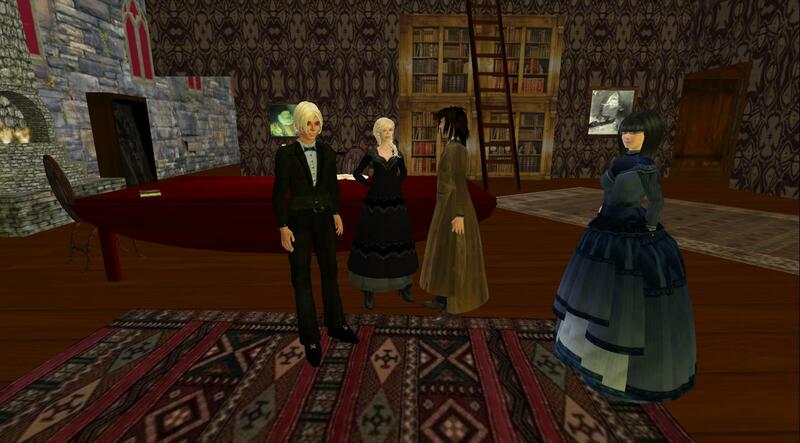 To begin with, the ‘cast’ of the story in the virtual world was dressed in authentic looking attire which one might have worn during the 19th century. Other than a few slipups, the characters conversed (through chat) in a manner similar to what one might expect from the people of the era. For the vast majority of us who read stories or watch movies for fun today, these art works are onetime thing – rarely do we watch a movie or read a story again. Developing simulation for movies and stories might change this. If a story is, for instance, simulated with multiple outcomes, the audience will try and change the end of the story from the original work, possibly to avoid a danger their favorite character faces in the original story. This might require more than a single attempt. This technique of storytelling has been employed in many video games over the years. In the Mass Effect trilogy for example the players actions could change the outcome and would be carried over three games something not possible in a two hour movie or even a long book. The atmosphere of the original [story] is kept in the simulation along with the added mystery of the final outcome. What I found impressive in the simulation was its small details. For instance, you need to say a password as the code to open the door in crypt. Though this advanced technology was not available at that time, it was particularly interesting when you typed in the password in the chat column and the door opened. You could virtually sit down, drink absinthe, and light a candle. The horrific sound tracks in the game really exaggerated the melancholy and dark atmosphere, which is something the film and original novel did not have. In “The Fall of the House of Usher” there was a lot of mystery surrounding the characters. Roderick’s actions were completely unexplained and readers finished the story with more questions than they started with. The interactive experience gave some insight into why the characters acted in certain ways. Unlike a movie, the student is not watching one person’s interpretation of a story. Instead, the student’s interpretation is combined . . . . with the teacher’s interpretation. I believe that the scavenger hunt that we went on to get the eggs added to the experience of the final by adding the mystery or giving an insight into what we would see in the final. The hunt could be considered the prologue to the final.